Seribu Islands Maritime Agriculture and Food Tenacity (KPKP) Sub-dept. holds subsidy food operation at Amsterdam RPTRA and Tanjung Elang RPTRA located in Untung Jawa Island and Pramuka Island on Wednesday (5/23).
" Rp 126 thousand per package for KJP cardholder. While PPSU and PHL personnel only get five items per package without milk for Rp 96 thousand"
Seribu Islands KPKP Sub-dept. 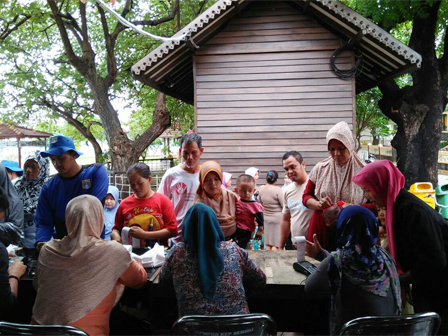 Head, Sutrisno said, there are six items in this subsidy food package which contains of one kilogram meat, one kilogram chicken, five kilograms rice, one kilogram mackerel, one kilogram egg, and one carton milk. Those who get this package are Jakarta Pintar (KJP) cardholder students, PPSU personnel, and PHL personnel. "Rp 126 thousand per package for KJP cardholder. While PPSU and PHL personnel only get five items per package without milk for Rp 96 thousand. Residents can buy it separately based on amount of their account balance," he informed, Wednesday (5/23). For cheap food operation in Pramuka Island, his side prepares 671 kilograms meat, 673 kilograms chicken, 672 kilograms egg, 672 bags of rice, 601 kilograms mackerel, 588 cartons milk. While in Untung Jawa Island, there are 386 kilograms meat, 386 kilograms chicken, 386 kilograms egg, 386 bags of rice, 381 kilograms fish, and 286 cartons milk. "This subsidy food program is held each month. Residents can buy it separately by paid Rp 30 thousand for five kilograms rice, Rp 35 thousand for one kilogram meat, Rp 8 thousand for one kilogram chicken, Rp 13 thousand for one kilogram mackerel, Rp 10 thousand for one kilogram eggs, and Rp 30 thousand for one carton milk," he conveyed.